Recently I have mostly been getting… some top stuff! It’s been a bit quiet here on the blog front. Not much have happened to write about, I’m slowly chipping away at the Doom Forgers. Have six in various states of WIP and three guys that are merely primed. I’ll have them done and posted up here in a few weeks time. The in-flow have been fairly slow too, luckily. Last week I got the dragon ogre below, and this week I got a few more tidbits, including the Warhammer Armies book (finally) and a snotling pump wagon (one more off the top wish list). From left to right: pumpwagon in bloody shambles, but salvageable. Dragon ogre in top shape. ADD1 mule (getting closer to a complete set there). Two orc warriors, one orc big’un (only lack about 10 warriors now and a single big’un to have those categories complete as catalogued in the ’88 catalogue) and an Olley black orc (don’t really like these guys, but he’s a chaotic looking chap and will fit in nicely in my chaos Olley warband). Then we have a Talisman conjurer (daft model, looks like Abe Lincoln pulling a rabbit out of a hat), a chaos warrior/champion and finally a lead belcher with a mish-mash of crew. 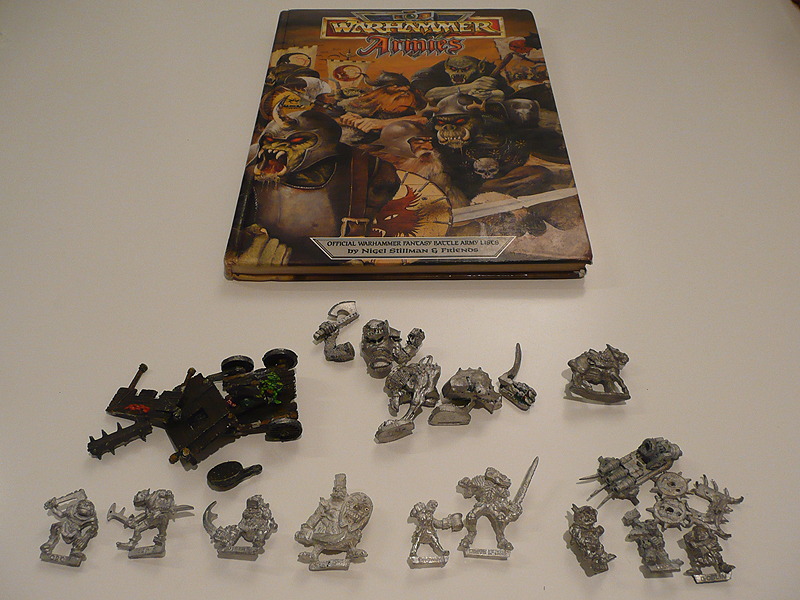 I also got a handfull of snotlings with the pumpwagon, but most (12) of them were actually the small Blood Bowl snots and will probably be traded away for “proper” snotlings. Thus I’m not counting them against my total, and the wagon including any snotlings on it is counted as one model for tally purposes. Which brings me to the total tally for 2012, now 62 painted – 251 acquired = -189. I’ve painted two models fully, but won’t adjust my numbers until they’re posted here. Just need to take a few photos. A very tasty haul indeed! I concur: very tasty. If you really want to trade the Blood Bowl snots away, I’d appreciate it if you’d drop me a line. Thanks for the heads up! There are a few I want! Long time since your last update – I guess you have painted all this stuff by now? !